Imagine receiving a gift of 113 acres on Tussey Mountain. That’s what happened to Mike and Laura Jackson back in 1988 when Laura’s parents, Richard and Phyllis Hershberger, gave them a portion of their farm. The Jacksons named their property Mountain Meadows and built a home with large windows for wildlife viewing. Part of the land had been pastured. Twice the woods on the higher slopes had been high-graded — “taking the best and leaving the rest” in forester parlance. Then a gypsy moth caterpillar outbreak dealt the final blow to most of the remaining oak trees. But Mike and Laura, who have devoted their lives to educating themselves and others about the natural world, were undaunted by the challenge of reclaiming their land for wildlife. Experimental and innovative, they have learned from their mistakes as well as their successes. On a bright, breezy day in late October my husband, Bruce and I bumped over the cattle guard across their driveway and into their three-acre yard, which is enclosed by a five-foot-high fence. There we joined 20 other members of the Juniata Valley Audubon Society on a guided tour of Mountain Meadows. Laura showed off the 150 foot by 50 foot wildflower garden they had established primarily to attract butterflies and other invertebrates. Although they had hoped to find a native wildflower seed mix suitable for their south-central Pennsylvania site near Everett, they had to settle for a northeastern United States wildflower mix that included cosmos and zinnias, both natives of Mexico, as well as coneflowers, lupines, scarlet flax, tickseeds, larkspurs, cornflowers, wallflowers, Shasta daisies, corn poppies, evening primroses, New England asters, foxgloves, and golden yarrow, only some of which are natives of Pennsylvania or even the northeastern United States. 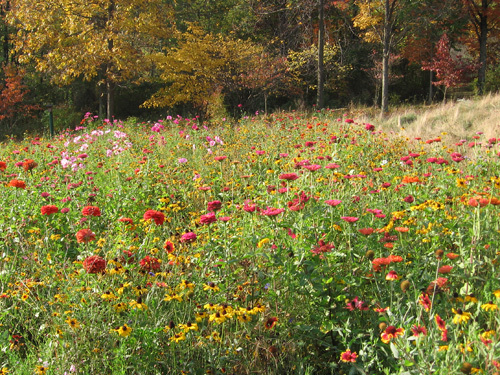 The day we visited the garden displayed a colorful blend of cosmos, zinnias, and cornflowers. Mike then pointed out a few of the many trees and shrubs they have planted for wildlife. In the past, they had planted non-natives such as buddleia, Calgary pear, burning bush, and Japanese honeysuckle without realizing they were invasive. Calling the knowledge of natives versus non-natives “a steep learning curve,” they finally established a rule that “if it is invasive, remove it. If it is not native and not invasive and provides food and/or cover for wildlife, then we might plant it within our fence,” for example, “blue spruce, holly, and annuals that attract bees, butterflies, and hummingbirds,” Laura said. Inside their fence, which is a deer exclosure, they can plant trees and shrubs without protection. Outside the fence, every tree and shrub has a wire fence or plastic tube around it. But now they use exclusively wire fencing. The five-foot-high tubes produce “wimpy trees,” Mike said, because the trees grow too fast in the moisture and heat-trapping devices. On the other hand, in wire fences trees grow slower and stronger. The tubes also attract paper wasps, which bears love, so they tear apart the tubes to get at the insects. Every spring the Jacksons order tree saplings from a variety of sources. During our visit, Mike sang the praises of red mulberry (Morus rubra). These wind-pollinated trees produce dark purple, edible berries in July that are eaten by eastern box turtles, and mammals such as gray and red foxes, gray and fox squirrels, skunks, raccoons, woodchucks and opossums, and once the Jacksons watched black bears mating below the mulberry trees. More than 20 species of songbirds are also attracted to red mulberry fruit. In the words of Charles Fergus, from his wonderful and informative Trees of Pennsylvania and the Northeast: “To observe frantic avian activity, stand in a mulberry grove when the fruit is ripening in early summer. Birds will be everywhere, gobbling down the sweet crop: grackles, starlings, cardinals, robins, catbirds, mockingbirds, thrushes, thrashers, orioles, waxwings, woodpeckers–even crows, clambering about clumsily on the springy boughs.” Unfortunately, such a sight is increasingly rare because red mulberry, which grows across the southern half of Pennsylvania, “has declined greatly in abundance over the last 200 years,” write Ann Fowler Rhoads and Timothy A. Block in their definitive Trees of Pennsylvania. Other native trees the Jacksons have planted are not as uncommon as red mulberry, for instance, the 50 to 60 eastern redbuds or Judas-trees (Cercis canadensis), which thrive in the southern part of the state and produce a haze of lavender-rose blossoms in early spring. The primary larval food for Henry’s elfin butterflies, their small, pea-like flowers also provide nectar for Henry’s elfins, eastern pine elfins, spring azures, duskywings, and other early butterflies as well as for honeybees. Sweet American or wild crabapple (Malus coronaria) is our only native crabapple tree and another species the Jacksons planted to attract wildlife. Grosbeaks, foxes, ruffed grouse, skunks, opossums, raccoons, deer, and black bear relish the yellowish-green, sour fruits that mature in autumn, partially fall on the ground and partially remain hanging from the branches throughout the winter. Washington hawthorn (Crataegus monogyna), another tree the Jacksons planted, is one of many confusing hawthorn species. This native produces fruits that furnish food during the fall and winter for deer, rabbits, raccoons, foxes, squirrels, ruffed grouse, and songbirds. In the former log yard, they have planted a variety of apple trees but, Mike said, they have to pick the apples before they mature and put them on the ground so the bears don’t rip the trees down to get the fruit. The Jacksons also wanted to increase nut-bearing trees on their property. Because the American chestnut tree is functionally extinct, they planted Chinese chestnuts (Castanea mollissima) instead. They also planted sawtooth oaks (Quercus acutissima), an Asian native, because they grow fast and produce acorns much sooner than our native oaks. Native shrubs that are wildlife attractants on the Jacksons’ property include both red-osier (Cornus serocea) and silky (C. racemosa) dogwood. These thicket-producing shrubs provide both food and cover for many birds. Winterberry (Ilex verticillata), still another choice of the Jacksons, has bright red fruits in September or October that often remain on the branches throughout the winter, hence its common name. Ruffed grouse, cedar waxwings, and other winter birds harvest the fruits. The Jacksons also put in a hybrid of the American hazelnut (Corylus americana), which produces sweet, edible nuts that are almost immediately harvested by squirrels, chipmunks, blue jays, deer, and ruffed grouse. In addition to planting trees, shrubs, and flowers to attract wildlife, Mike constructed an enormous, tepee-shaped wildlife brush pile in their woods. At its base he has a hole big enough for a hibernating bear to crawl into. Although he set up a trail camera near the brush pile and caught a sow and her cubs on film, so far no bear has hibernated in it. Mike is an avid deer hunter and has built a huge tree stand in his woods. During our walk along their woodland trail, we saw many mature shagbark hickory trees, two healthy butternut trees, and an enormous white oak that took three people — their arms outstretched — to reach around its trunk. Mike also showed us his American Woodcock Habitat Site where he has to remove dozens of invasives to make it viable for woodcocks. Back in 2002, the Jacksons joined the Pennsylvania Forest Stewardship program and, working with their Service Forester, drew up a plan for their property that emphasized attracting wildlife. They have documented their work to improve their land under the stewardship program in a loose leaf notebook, complete with photos. More recently, they have added American mountain ash and witch hazel to the tree species on their property. As former teachers — Mike taught fifth grade in the Everett elementary school and Laura taught advanced biology and environmental sciences in Bedford High School — they have been keeping lists of the plants and animals on their property. Of the 37 mammal species, a Russian wild boar was the most distressing and a bobcat the most exciting. They’ve also recorded 117 bird species, 29 shrubs, 13 vines, 14 coniferous trees, 78 deciduous trees, 8 snakes, 4 turtles, 8 frogs and toads, 4 salamanders, and, so far, 92 insects, and 8 spider species. Mike takes special interest in the eastern box turtles and timber rattlesnakes he finds. One notebook is devoted to the turtles. He photographs each turtle’s shell and plastron and files a notch on the edge of its shell. That way, when he sees a box turtle, he can figure out whether it is new to him or a repeat. Just before we arrived, he recorded box turtle #90 — an astounding number. Once he watched a female lay eggs on a path that they planned to dig up. He moved the eggs into a raised bed in their garden and fenced it. He and Laura kept a close watch on it and saw hatchlings emerge from it late in the summer. Mike, with the help of Laura, is also adept at handling rattlesnakes. Each year he captures every rattlesnake he sees and measures it. So far, the eight he has captured have been between 36 and 45 inches long. He also sexes and photographs them. When I asked him why he does this, he said, “Because I’m curious about them. Are any returning? How many do we have? How much do they grow every year?” And once again, he keeps meticulous records on them. Did I mention that they were wildlife rehab assistants under a local veterinarian for ten years? In that time they rehabbed 54 orphaned opossums, 34 gray squirrels, 17 red-phase and 16 gray-phase eastern screech-owls, and 7 American kestrels, in addition to barred owls, a beaver kit that the PGC gave them to raise, and a baby flying squirrel. 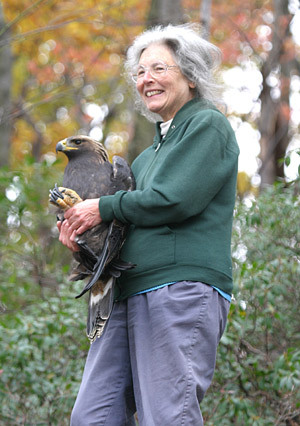 Laura particularly enjoyed raising owls, but she told a funny story about the flying squirrel. The day of our visit their bird feeders hosted three male purple finches and a female. Their turkey pen held wild turkeys that they raise. Water lilies bloomed in a water garden in front of their home, which contained green frogs, a painted turtle, and a bullfrog. Laura has taken a part time job, since she retired, as Director of the Bedford School District’s Environmental Center, but both she and Mike have taken on an even more monumental volunteer position. As founders of SOAR (Save Our Allegheny Ridges), they are trying to educate people about the detrimental effects of industrial wind farms on wildlife. Although they are not opposed to wind farms if they are appropriately sited in states “where the wind comes sweeping down the plains,” and even on such devastated areas as former strip mines, they are appalled that for a possible one percent of the electric power we need, plans are afoot to put them on many of the mountaintops in northern and central Pennsylvania. These mountaintops contain some of the state’s last unfragmented habitat for wildlife. Already the Jacksons have documented with photos the problems this so-called “green power” is causing on our mountaintops, namely, erosion, despoiling of Class A wild trout streams, and providing, on land that has been cleared for access roads and around the windmills, ATV trails. Fishermen and hunters are alarmed to see still more of our wild land and waterways compromised. Studies by wildlife biologists have already documented incredible bat kills during migration as they are chopped up by the enormous windmill blades. The blades are also a danger to migrating songbirds and raptors, all of which use our ridges as migratory corridors. Canada has many industrial wind farms, but they have a law that forbids building them on mountaintops. Too bad we haven’t followed their example. Every day, it seems, the Jacksons send us notice of still another problem with the siting of industrial wind farms. The Jacksons always thought of themselves as conservationists, but now they have become environmentalists in defense of wildlife. Wish them luck in their venture. All photos were taken by Bruce Bonta. What a fruitful year this is. Best of all is the resurrection of our black raspberry bushes around our homegrounds. Their plenitude was what persuaded me to buy this place. And then the deer moved in. For decades they have eaten every raspberry cane that has dared to appear. But now that our hunter friends have lowered the deer herd, the black raspberries have a fighting chance. I say “fighting” because even so the deer continue to trim back every cane they can reach. They don’t like steep slopes, though, and that’s where I’m picking in this video. The good news is that our shrub layer is making a comeback in some places. The bad news is that most of the shrubs are growing in places inaccessible or inconvenient to deer. Take common elder. When we first moved here, 36 years ago, a line of common elder shrubs grew behind a barberry hedge that stretched sixty feet from our chicken shed to the guesthouse. Several more common elder shrubs thrived at the bottom, wet edge of First Field. Every year I had more than enough clusters of purple-black berries to make several batches of elderberry jelly. But without my noticing, those shrubs gradually disappeared. No doubt they had reached the end of their lifespan, or so I thought. I missed their lovely flowers “foamed over with blossoms white as spray,” as poet James Russell Lowell once described them. Also known as “sweet elder” and “American elder,” few of our native shrubs are as widespread, abundant, and well-known,” Pennsylvania author William Carey Grimm wrote in The Book of Shrubs, back in 1957. Because this native shrub grows from Nova Scotia to Manitoba, its species name is canadensis (of Canada), but it also ranges as far south as Georgia, Louisiana and Texas. Common elder was once called the “medicine of the common people,” and elderberry juice was used for treating a wide range of problems including arthritis, gout, diarrhea, coughs, and colic. More recently, scientists discovered that common elder is extremely high in Vitamin C.
I never did experiment with drying the berries, but maybe I will now that we once again have a line of elderberry shrubs bearing fruit. Unfortunately, every one of those shrubs germinated inside our three acre deer exclosure. Only when I saw them thriving there did I realize what had happened to our original, unfenced common elder hedges. The common elder genus name Sambucus comes from the Greek “sambuca,” which is purported to be a stringed instrument made from Sambucus racemosa–the red-berried elder. That too is a common shrub in Pennsylvania and, unlike the common elder that blooms in late June and July, the red-berried elder displays pyramid-shaped clusters of white flowers in late April or early May. The red-berried elder, also a European species, is labeled with the variety name pubens in North America, and is found from Alaska to Newfoundland and south through the Appalachians to Georgia. It has a bevy of common names, a few of which are “red elder,” “scarlet elder,” “mountain elder,” “red elderberry,” and “stinking elder.” Red-berried elder grows in cool, moist, rocky woods and ravines. When it is fruiting, in late June and July, its showy, scarlet berries are a favorite food of birds such as rose-breasted grosbeaks, eastern bluebirds, gray catbirds, and American robins as well as chipmunks, woodchucks, foxes, squirrels, and rabbits. Somehow, they can withstand the cyanogenetic glycoside and an alkaloid in the berries that make us nauseous or can cause vomiting, diarrhea or gastrointestinal pain. But dyes have been concocted from the fruit, bark and stems and an insecticide from dried leaves.Last spring I found several red-berried elders growing on the tip-up mounds of uprooted tulip trees, on the steep slope below Ten Springs Trail, and on the Far Field road bank, where they are protected by piles of ice-storm broken branches. All those places are inaccessible to deer. On the other hand, below the forks on a flat area beside our stream, which is accessible to deer, I found many small red-berried elder shrubs plus spicebushes and witch hazel trees last April. Both elder species are members of the Honeysuckle Family. So too are three other native shrubs struggling to survive on our mountain. Two are viburnums. The viburnum genus, as a whole, is favored by deer, but I found a couple black hawks (Viburnum prunifolium) in bloom at the edge of the Far Field a couple years ago. Also known as “stagbush,” “nannyberry,” “sheepberry,” and “sweet haw,” its species name means “plum leaf,” which describes the appearance of its leaves. It has flat-topped clusters of white flowers that appear in May or June, and birds and mammals eat its dark, bluish-black, oval-shaped fruits that ripen in early fall. We also have maple-leaved viburnum (V. acerifolium) growing sparsely on our road bank and abundantly in our deer exclosure. It used to be a frequent understory shrub in Pennsylvania’s deciduous forests. Named for its maple-shaped leaves, its flat-topped, white or pink-tinged clusters of flowers bloom from mid-May until mid-June, and its bluish-black fruit ripens in September. But the fruits are not particularly palatable, and only a few birds bother with them. Other names for maple-leaved viburnum include “flowering maple,” “squashberry,” “dockmackie,” “guelder-rose,” and “possumhaw,” so perhaps the latter name implies that opossums eat the fruits. The last shrub member of the Honeysuckle Family on our property is bush-honeysuckle (Diervilla lonicera), which I found blooming on the road bank on June 24. Because it is popular summer browse for deer, I was delighted to discover several shrubs with terminal clusters of funnel-shaped, pale yellow flowers. Also called “dwarf bush honeysuckle” and “yellow flowered upright honeysuckle,” it is not a true honeysuckle at all even though its species name lonicera, which is Latin for “honeysuckle-like” appearance, is the genus name for true honeysuckles. It ranges from Newfoundland to Saskatchewan, south to Iowa and the Great Lakes, east to Delaware and, in the mountains, as far south as North Carolina. For years our rocky road bank has also provided refuge for wild hydrangea (Hydrangea arborescens), a member of the Saxifrage Family. Slowly it has moved up the hollow, providing plentiful flat-topped clusters of creamy-white flowers that light up our forest roadside in June and July. Occasionally, we find a few larger, sterile flowers, which usually blossom on cultivated hydrangea called “Hills of Snow.””Hydrangea” means “water vessel” in Greek because of the cup-like shape of its dried fruits. Supposedly it is poisonous to livestock, but the deer don’t seem to mind nipping it. Its species name arborescens means “becoming tree-like,” a reference to its becoming woody with age, hence its alternate name “tree hydrangea.” Another name is “seven barks” because its stem bark peels off in several layers of thin, different-colored barks. One sad shrub loss that has nothing to do with deer-grazing is that of our abundant mountain laurel (Kalmia latifolia), a member of the Heath Family. Ed and Maureen Levri, both in the Biology Department at Penn State Altoona, are studying mountain laurels inside and outside our deer exclosure. They suspect that its spotted leaves and, in many cases, subsequent death are due to a leaf fungus. Many mountain laurel shrubs still survive, especially on the powerline right-of-way, but in the depths of the forest I can find almost as many dead shrubs as live ones and even those look unhealthy. No longer do they provide the dense deer cover they used to, and their lavish display of blossoms every June is only a memory. On the other hand, we are seeing the recovery of another member of the Heath Family, the rhododendron (Rhododendron maximum), also known as “great laurel” or “rose bay.” High on Laurel Ridge, several hundred feet above our stream, Rhododendron Trail winds through dozens of large (eight to ten feet tall) rhododendrons. All have grown beyond the reach of deer browsing, just as those few have that overhang our stream and road bank. A few more large rhododendrons grow beside Guesthouse and Black Gum trails. Other, small ones have struggled for years to get above deer height and have been grazed down to the nubbin in most cases. Then, a couple years ago, I noticed new shrubs sprouting and thriving along Laurel Ridge Trail and only occasionally being nibbled by deer. At the same time, what had been a bare slope above Rhododendron Trail was green with newly-germinated rhododendrons. So far not one has been grazed. Although deer continue to eat rhododendron, particularly in the winter, it is not a favorite food. But Grimm did write in The Book of Shrubs that “in many sections of the state, where deer are entirely too numerous, the shrub is often browsed to excess,” so we believe that our recovering rhododendron may be a sign that our hunters’ diligent harvesting of more than 40 deer every year on our square mile of mountain land is having a positive effect on our shrub recovery. Our mountain azalea (Rhododendron prinophyllum), also known locally as “wild honeysuckle,” is another member of the Heath Family that ranges throughout the rocky woods of Laurel Ridge. Its bright pink flowers perfume the forest in May. Usually I smell it before I see it, so intense is its clove-like fragrance. Both inside and outside our deer exclosure, new shrubs have sprung up, and I am hopeful that it too will make a comeback. Many studies show that in order for our shrub layer to recover, we must have less than ten deer per square mile. Without the large predators our forests once had to keep the deer numbers down, as we did during Colonial times when it is estimated that we had between eight and eleven deer per square mile, we must depend on good hunters to do the job. Only then will our forests have all the components they need to grow and thrive and produce both food and cover for an abundance of songbirds and mammals.